Bhubaneswar:22/8/18; The festival of Eid al-Adha also known as Bakrid is being celebrated by Muslim community with religious fervour at various places across the State today. 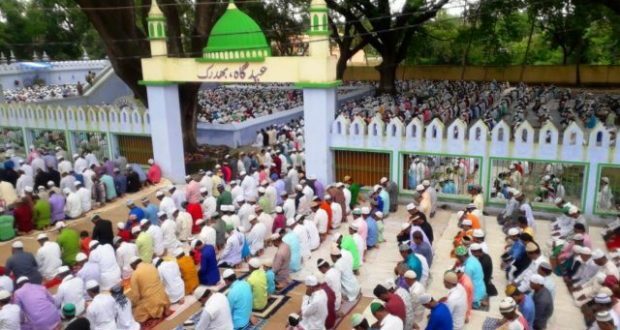 As part of the celebrations, special mass prayers are being organized at mosques, eidgahs and open grounds at various places, mostly Cuttack, Kendrapara, Bhadrak and Balasore. Large number of people belonging to the minority community congregated at the venues and offered special prayers.At some places, some Hindu families visited houses of their Muslim friends and greeted them on the occasion. Police personnel have been deployed at several sensitives locations to avoid any untoward incidents during the celebration. Meanwhile, Chief Minister Naveen Patnaik extended his greetings to Muslims on the occasion. “Warm wishes to all on Eid-ul-Zuha. May the spirit of Eid bring joy & prosperity in our lives and further us on path of harmony, compassion and brotherhood,” Patnaik wrote in Twitter.